Before going to the list of top historical soviet movie, you might curious what differentiate between the Soviet and Russian movie. Although the two use the same Russian language, they have distinctive character in terms of dominant themes of genre used. While Soviet tend to show their strong character of people and history as dominant movie theme, Russian mostly used philosophy and social realism as their way to influence people. First released in December 1938, this movie is known worldwide as the best historical drama movie produced by the director Sergei Eisenstein. Since the released date, this movie became a great success with the fantastic total viewers around 23 million people. The movie was taken during the Stalinist era, the time when Soviet Union had a strained relationship with Nazi Germany. From the background, it can be clearly seen that the movie reflected the political situation at the production time. The movie in general is telling about the invasion of Novgorod by the Knights of Teutonic who come from the Holy Roman Empire, which can be defeated by the Alexander the Prince who is known popularly as Alexander Nevsky. He became the center character in this movie, which is portrayed as nobleman who saves the country, the one and only hero of nation. I really recommend this historical movie since it contains lots of historical knowledge, one of the best ways to know history. This movie belongs to the historical genre since the story focused on the character which has great roles in the Soviet times. By the hand of director Vsevolod Pudovkin, this movie has received many awards from the filming festival, both from local and International. The story portrayed real actual life of Admiral Pavel Nakhimov who has outstanding leadership in defending his troops from the strong enemy Turkish army. This true story happened in 1853 of the Crimean War. The development of story is quite breathtaking, especially the scene when Russian Black Sea sink in the Sevastopol harbor, continue with a series of heroic events. It is one of historical biography movies that you should watch. Another historical biography movie genre produced by Soviet filming industry which gains much attention from the viewers, this movie belongs to Mikhail Romm’s masterpieces. It released in 1953. This movie tells a true story of Russian legendary commander named Admiral Fyyodor Urshakov, the war heroes from 18th centuries and his roles for the country during the Rosso- Turkish War. Learning Soviet history would never be as excited as watching its historical movies. Directed by Stanislav Rostotsky, this Soviet historical movie is produced based on the novel with the same titled written by Boris Vasilyev. It was released in 1972 and was nominated for an Oscar Academy Award for Best Foreign Language Film category in the same year of release. The movie plot is mainly about the role of Russian female soldiers in the period of World War II, the women soldiers were assigned to replace a commander troops in a small village. The adaption of one another who finally ends with the coming of war from German troops. War and Peace is war historical movie which is adapted from the Novel written by Leo Tolstoy in 1869. It is directed by Sergei Bondarchuk and produced by Mosfilm studios with the support of Soviet authorities. Since its released around 1966-1967, War and peace movie hits success with total ticket sales around 135 million. And not surprisingly, the movie got many awards from the International academy Awards for Best Foreign Language Film Category. Based from the title, the story tell the viewers about prince of Russia who experiences battle against Napoleon and the army, along with the help Russia society despite their social status. This war is also known as Great Patriotic War. After the hard effort, the Russian can finally drive Napoleon away from the city. This movie is based on the life of Andrei Rublev, with the background of 15th– Century Russia. Released in 1969, Andrei Rublev later belongs to the 100 Best Films in the World Film Festival. This movie is directed by Andrei Tarkosvsky. The story mainly focused on the life of Rublev along with the afflictions he must face, and the identity of political state. Believe me, you should watch this to know deeply about the period of Russian history. Siberiade is a great artworks ever made by the talented director Andrei Konchalovsky. Divided into 4 parts, this movie has total 275 minutes of duration. It was released for the first time in May, 1979 Cannes Film festival and then followed by Russian released in January, 1980. The story line is focused on the two Siberian families – Solomins and Ustyuzhanin- who live in the remote Siberian village of Elan from three generation, start from the beginning of 20th century until the early 80s. While the movie in general portrayed about the historical aspect of Siberian culture as part of the Russian revolution. 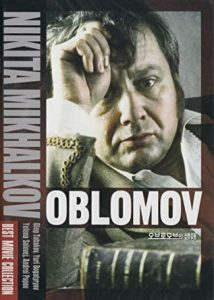 Oblomov is a Soviet comedy movie which is directed by Nikita Mikhalkov. This movie is adapted from a novel written by Ivan Goncharov. Released in 1980, the title was derived from the name of the main character, Ilya Ilyich Oblomov. Thus, the story line here focused on the life of Oblomov, the middle aged nobleman who came from St. Petersburg. The center character here indicates the superfluous man found in 19th Russian literature, the perfect man who hardly find in real life.